JHR Colors Your World, Corp. Comment: I'd like to refinish the cabinets in my kitchen. This would include sanding and repainting in a satin finish. I have a small kitchen, 7'4" x 8'8" The extent of my cabinets: 24" double door base cabinet under sink, panel but no drawers 18" single door base cabinet with single drawer 24" double door base cabinet with two drawers ~10" single door base cabinet with single drawer 8" base area that has a fake cabinet drawer and panel 18" single door top cabinet 24" x 12" double door top cabinet over refrigerator 24" double door top cabinet 24" x 12" double door top cabinet over microwave ~10" single door top cabinet All cabinets are standard height, there is no molding or trim I'd like to keep the existing door knobs as well There is water damage on the two doors of the cabinets under the sink This is in a condominium so the HOA will require proof of insurance. Comment: We are looking to build bookshelves on both sides of our living room window and a window seat with storage under the window. The timing of the project would be end of June - August so right now we are just looking for design ideas and cost estimates. Chicago Cabinet Contractors are rated 4.73 out of 5 based on 1,500 reviews of 86 pros. 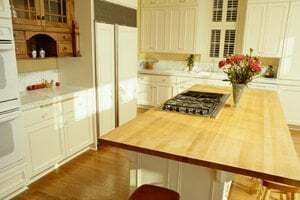 Not Looking for Cabinets Contractors in Chicago, IL?